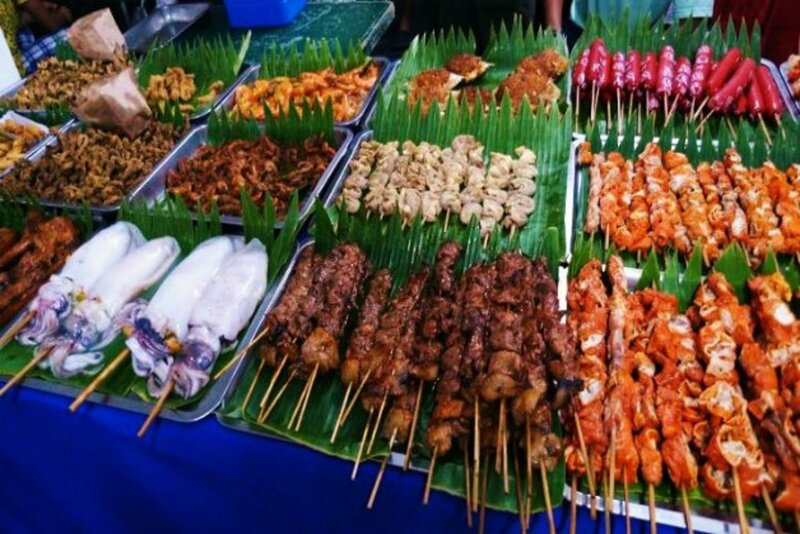 As you roam around the streets of Philippines, the tempting scent of barbecue on skewers, hotdogs along with favorite fish balls, isaw and more street foods will make your tummy growl. Walking specially on the streets of the country's capital, Manila, one would see a number of vendors, with their deliciously enticing, cheap street foods. Some may not look appealing but people find these street eats tempting. 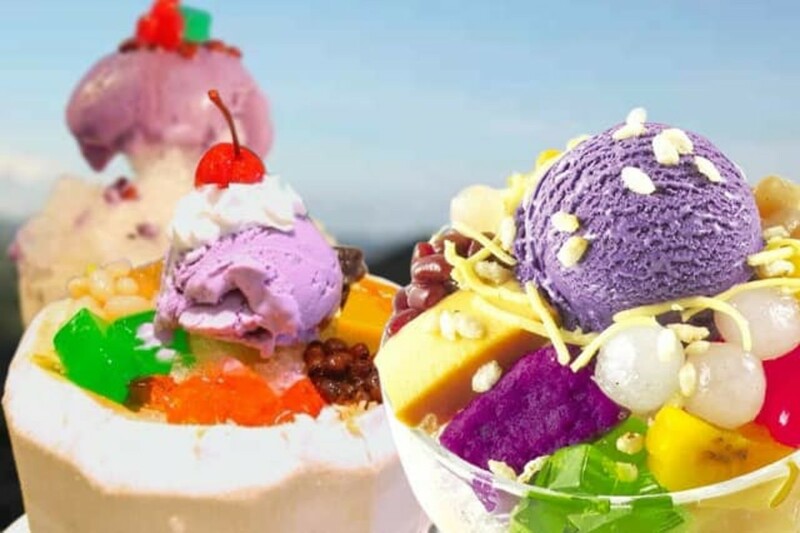 The mouth watering halo-halo and the echo of the taho vendor's call means delicious street food fit in your budget that is hard not to indulge one's self into. 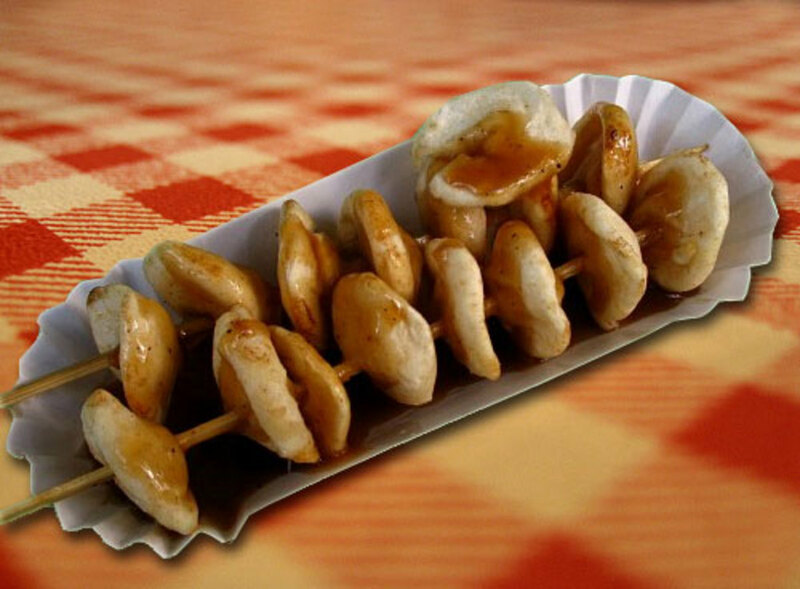 So what are the Filipino popular street foods one can try when visiting the Philippines? Adidas are made from chicken feet. Fried and simmered until tender from mixture of soy sauce, oyster sauce, and sugar, this Philippine street food is tasty and is one favorite pulutan (finger food) along with beer or other alcoholic beverage. For those who wants it spicy, chili can be added. Adidas makes a delightful street food experience. It is also good with rice and some prefers it that way. The colors -- it looks delicious, and it is. 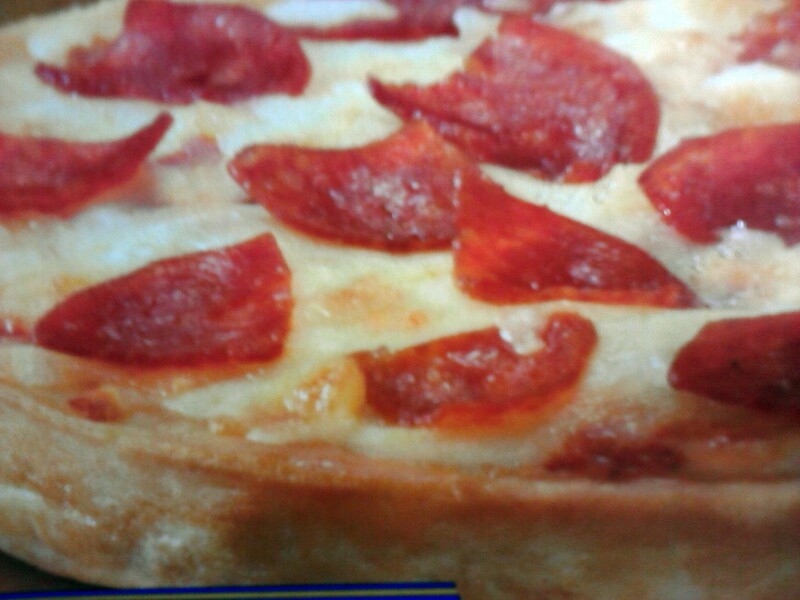 Derived from the word halo (to mix,) the name pertains to its various ingredients. Halo-halo is a favorite and popular dessert and street food in the country to wrestle the hot summer days of the land. This goodie, made from shaved ice is layered with mouth watering ingredients such as sweet palm, jackfruit, silky coconut, coconut gelatin, caramel flan, mung beans, rice crisp, purple yam, sweet corn, evaporated milk and topped with your favorite choice of ice cream. 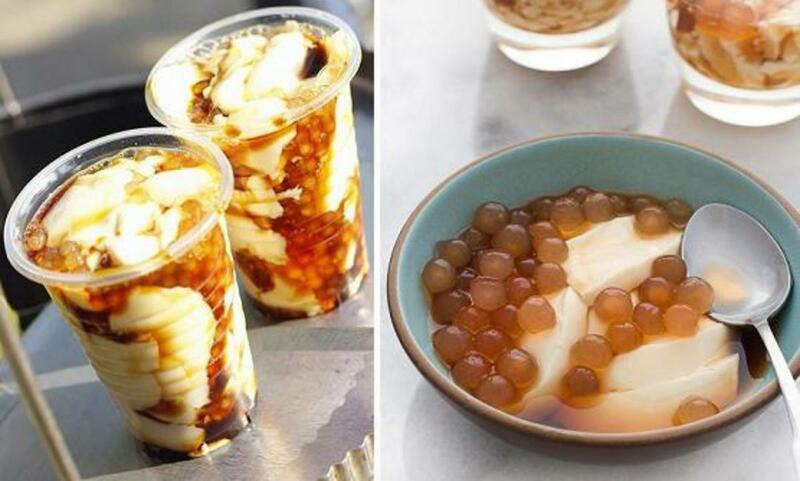 Made of soft tofu with sago pearls added and sweetened with vanilla and brown sugar syrup, taho is sold throughout the day, starting early in the morning when it is still warm. Taho vendor shouts "Taho!" 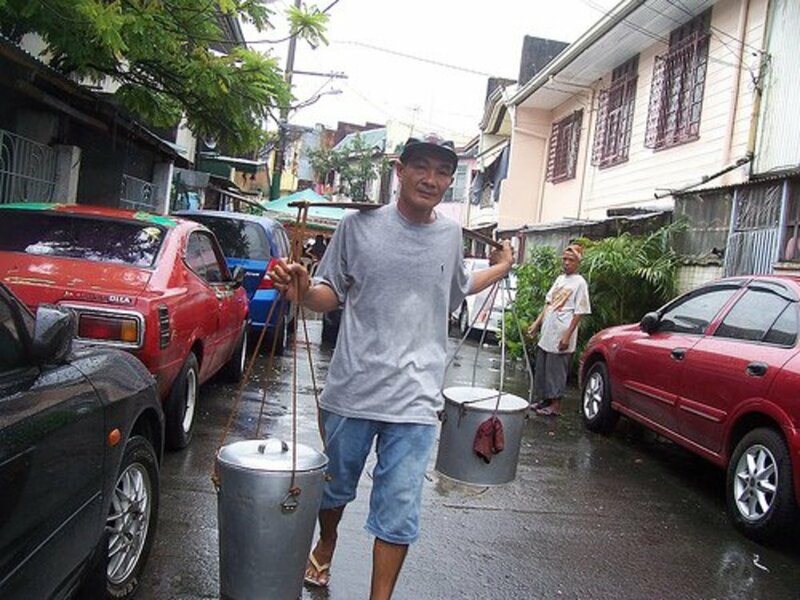 as he makes his route through the streets of Manila or in the provinces in a leisurely pace letting the neighborhood know that he is around the area for anyone ready to start their morning with the delicious taho. 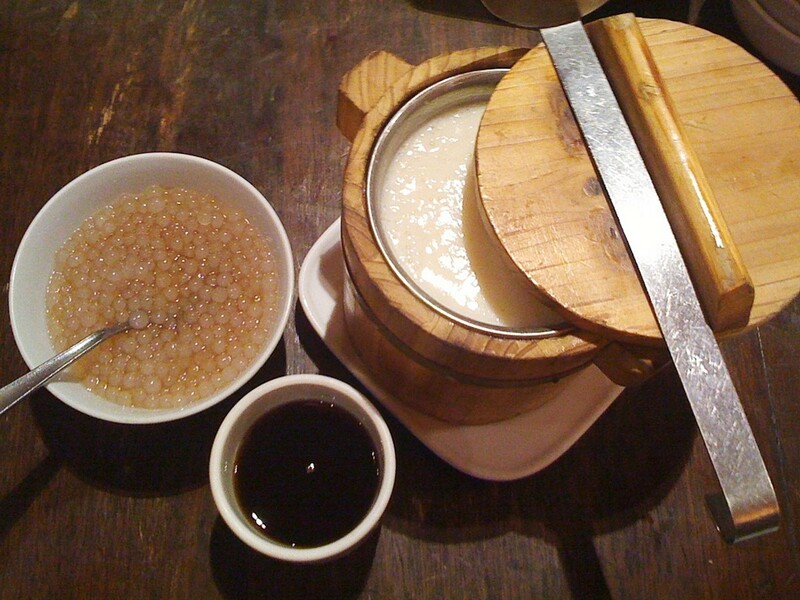 The taho vendor carries two buckets at both ends of a yoke, one bucket for the silken or soft tofu and the other bucket is for the sago pearls and syrup called arnibal. For those who enjoys this treat, waiting at the front gate with money ready in hand when the vendor is about to arrive is better than running after the taho vendor when he already passed by. Also calling back "tahoooooo" is not uncommon to get the vendor's attention of interested customers. 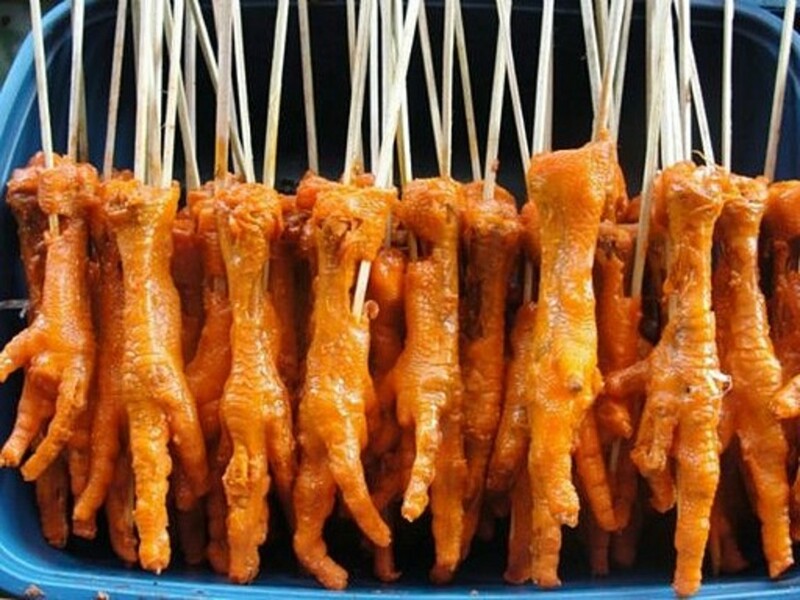 This Filipino street food is made from chicken intestines. After the intestines are thoroughly cleaned inside out and cleaned using vinegar, they are boiled and skewered into bamboo sticks then grilled over charcoal. Isaw is basted with a mixture of catsup, chopped garlic, ground pepper and soy sauce while grilling. With the sauce, it is often eaten with spiced vinegar along with ground black pepper, hot chili, salt and chopped garlic while some just want catsup. This somehow orange-like fruit is made of quail eggs, rolled in cornstarch, a mixture of flour and annatto giving it the reddish color and fried. Dipped in a spiced-vinegar sauce, it is an enjoyable popular street eat. 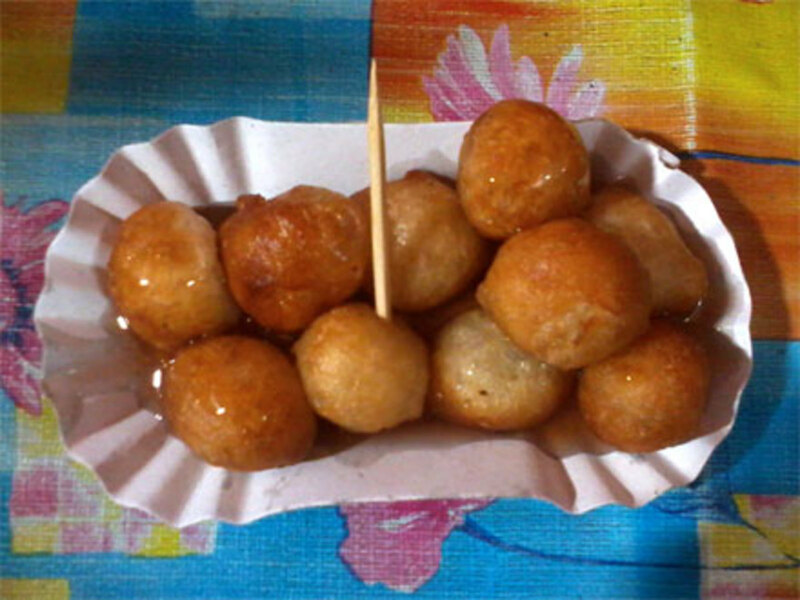 Hard-boiled eggs is also used but when hard-boiled eggs are used instead of quail eggs, the delicacy is no longer called kwek-kwek, but is called tokneneng. 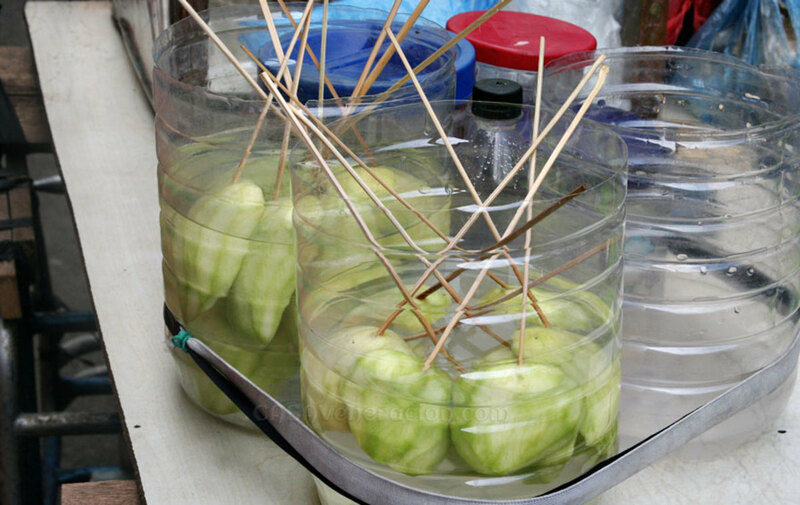 Another street food favored by Filipinos are skewered green mangoes. There's nothing special about it, really, just a green mango fruit, skewered and with bagoong which is either fermented shrimp sauce or fish sauce. This inexpensive skewered fruit is a delight to satisfy the craving for a green mango. Pig's skin cracklings, chicharon comes in a plastic bag or wrapped in a styrofoam sealed with plastic. 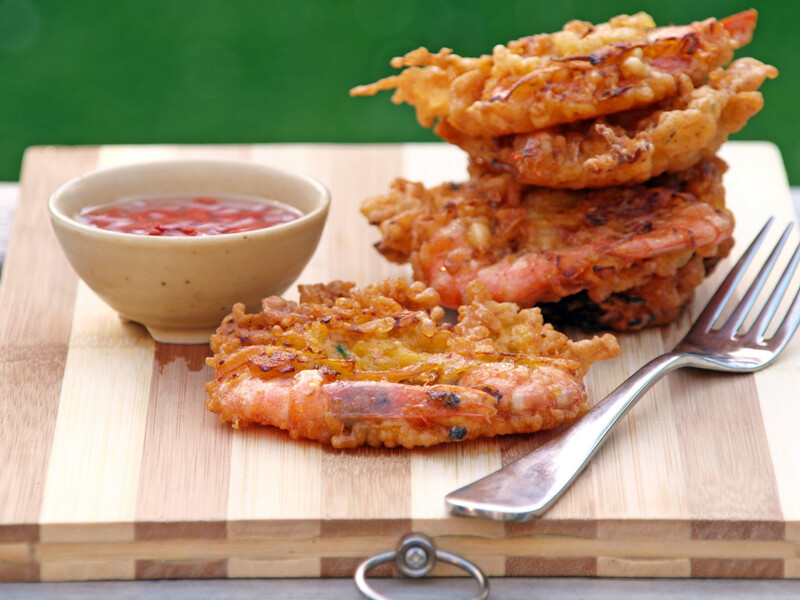 This crunchy treat is also a favorite finger food or pulutan with alcoholic beverages. 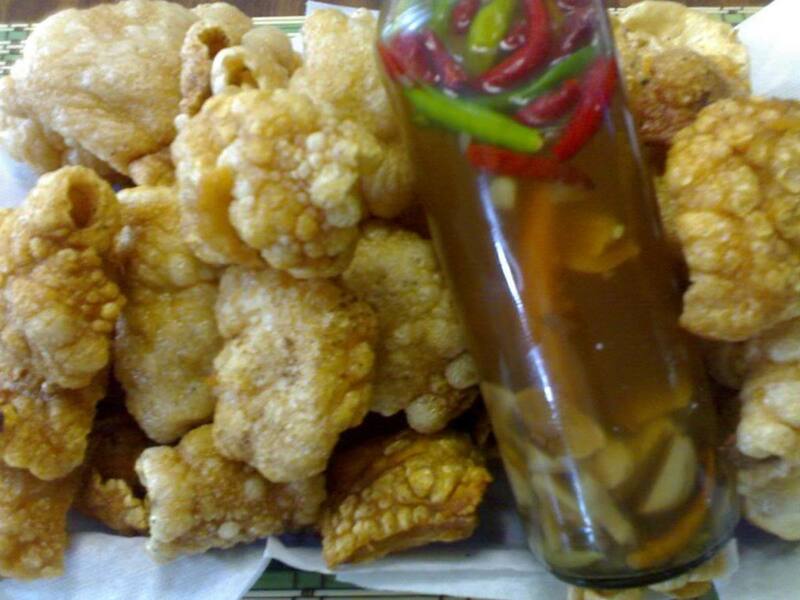 Some chicharon comes with spiced-vinegar, usually hot chili and chopped garlic and best enjoyed with it. Vendors who mount buses while on a traffic jam carries chicharon with the spiced-vinegar along with other street foods. Named as resemblance of a Betamax tape, betamax are grilled chicken blood which then roasted and skewered. Without any spices added to it, the coagulated chicken blood is tasteless once grilled. But by dipping it in a spiced-vinegar before a bite, that would give it some taste. Made from either shredded fish or squid, this goodies are fried, skewered in bamboo sticks and accompanied with a vinegar-spiced sauce, or either hot and sweet sauce. Yum. 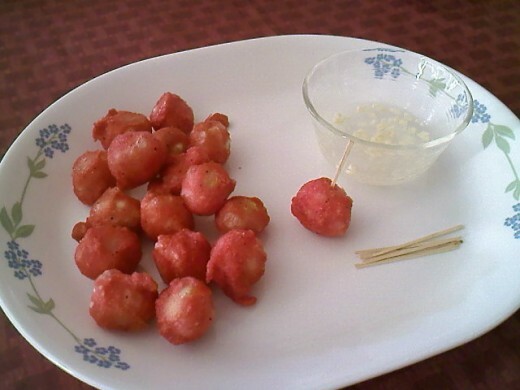 If not on bamboo skewers, fish balls or squid balls are serve on paper plates with a barbeque stick to use and one's choice of sauce. 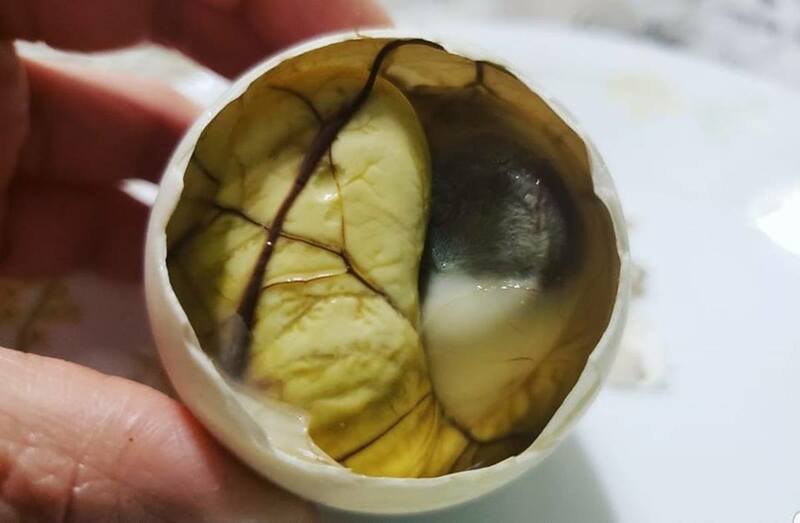 A delicacy featured on Andrew Zimmern's "Bizarre Food," balut is a fertilized, boiled duck egg with an embryo inside. Best and enjoyed warm, vinegar or salt is optional but is preferred by most. Just crack the shell on either tip, making a small hole and sip the liquid before completely cracking the shell up and eating the egg. Balut is sold throughout the day either stored in a styrofoam box, or in a basket hand carried by the balut vendor while shouting "baluuuttt" as he wanders the street. Balut is also often sold along with penoy, a boiled duck egg without the embryo. Ukoy is made of small shrimps and sprouted mung beans, dipped in a batter made of flour, corn starch, egg and spices. This is another deep-fried street eat serve with vinegar, spiced with chopped garlic, ground black pepper and chili. 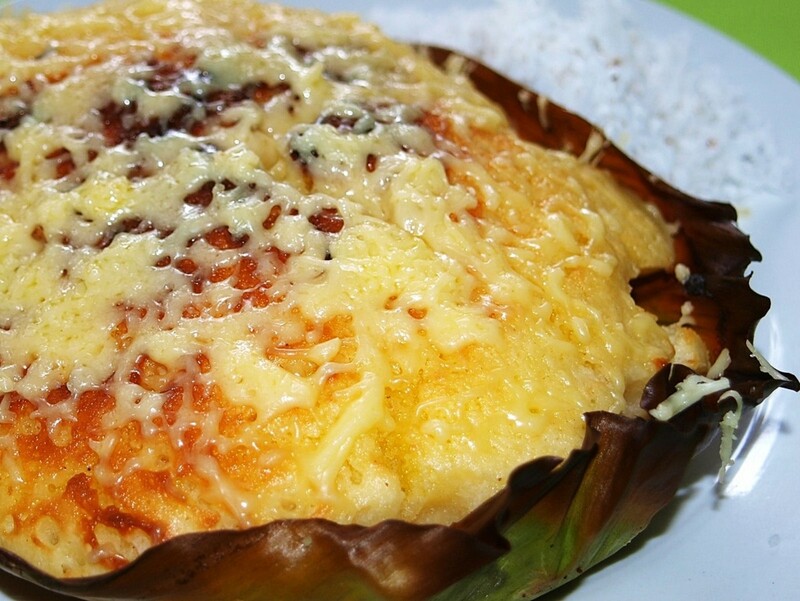 Ukoy is enjoyed as mid afternoon snack or merienda but is also good with rice. The country's version of the Mediterranean calamari. 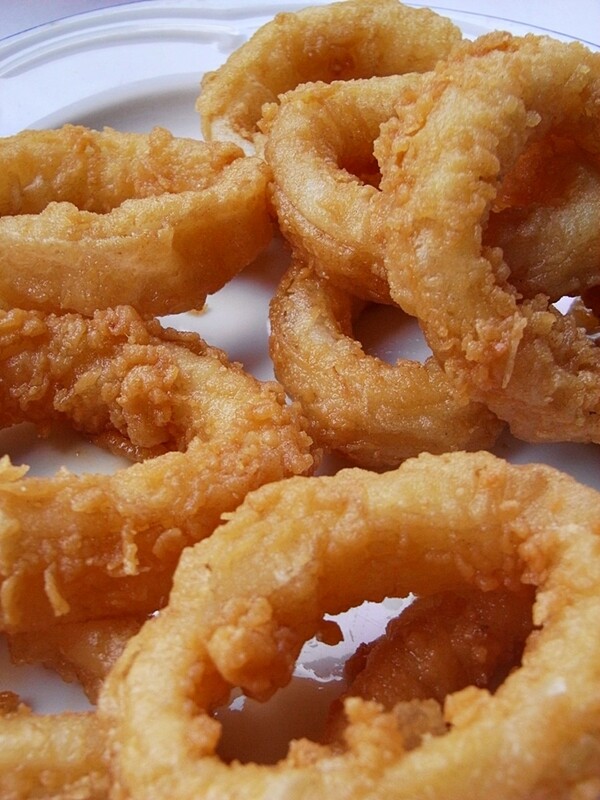 Squids, sliced into rings are dredged into flour, dipped in beaten eggs and rolled over breadcrumbs are deep-fried. For the sauce? The vinegar, spiced with chopped garlic, ground pepper and some likes it with chili. 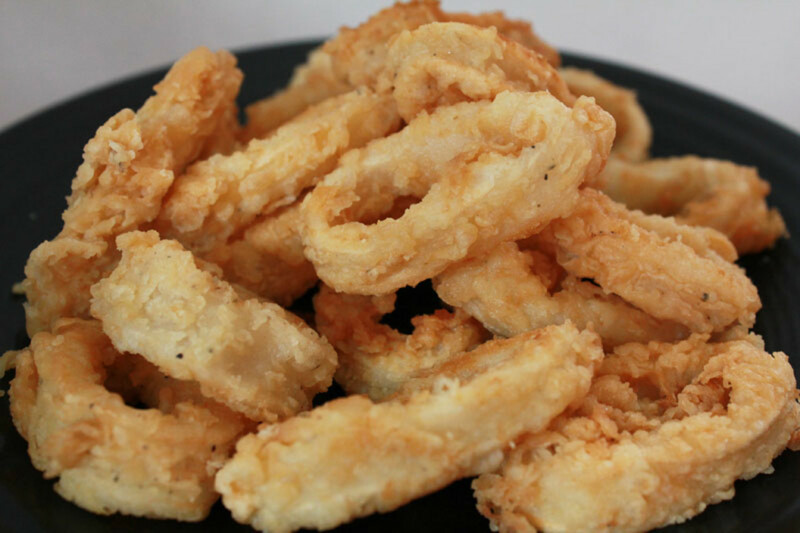 Calamares is another favorite Filipino finger food, a good match with beer. Kikiam is one of the Chinese dishes that has been adopted into the Filipino cuisine. Kikiam, called que-kiam by the Chinese is made of ground pork, shrimps, diced vegetables such as carrots, chopped chives, water chestnuts along with spices and a beaten egg is mixed together and wrapped into a bean curd sheets and deep fried. Kikiam is enjoyed with sweet and sour sauce. 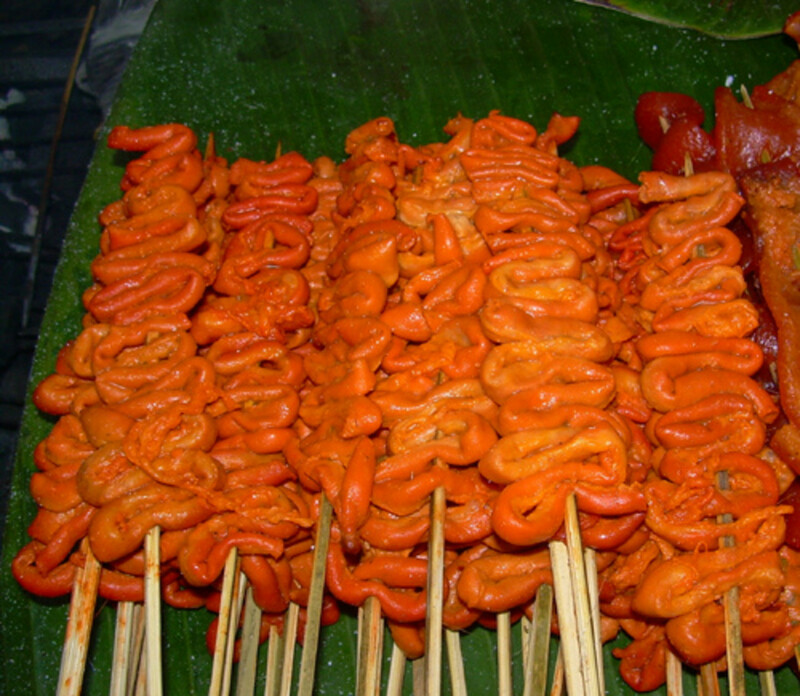 Sliced pork or chicken, marinated in a mixture of catsup, soy sauce, and sugar are skewered in a bamboo stick and grilled. The same mixture is also used to baste each barbeque while grilling. 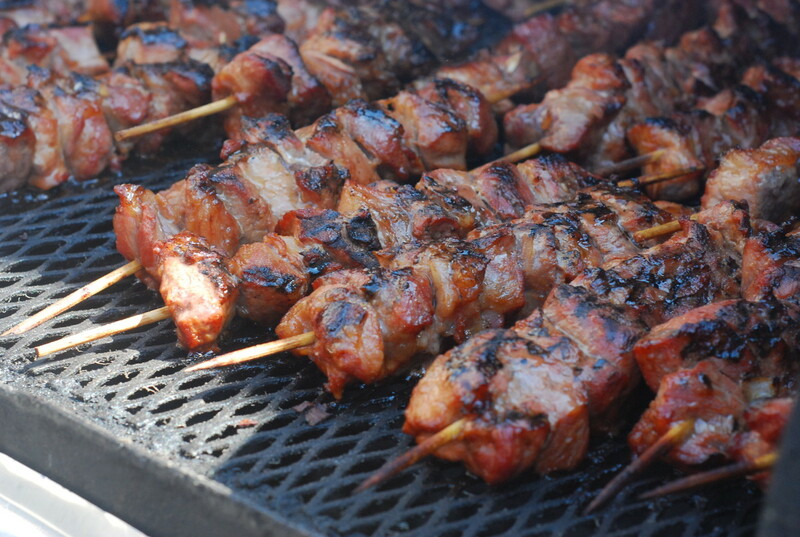 The result is a flavorful, mouth watering skewered barbeque. Also some prefer using the ready to use bottled barbeque marinade. 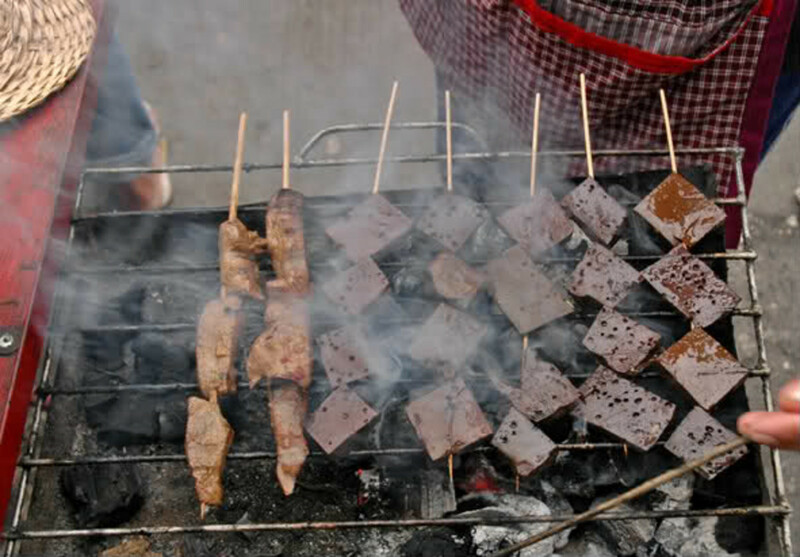 Skewered barbeque is often enjoyed with spiced-vinegar. 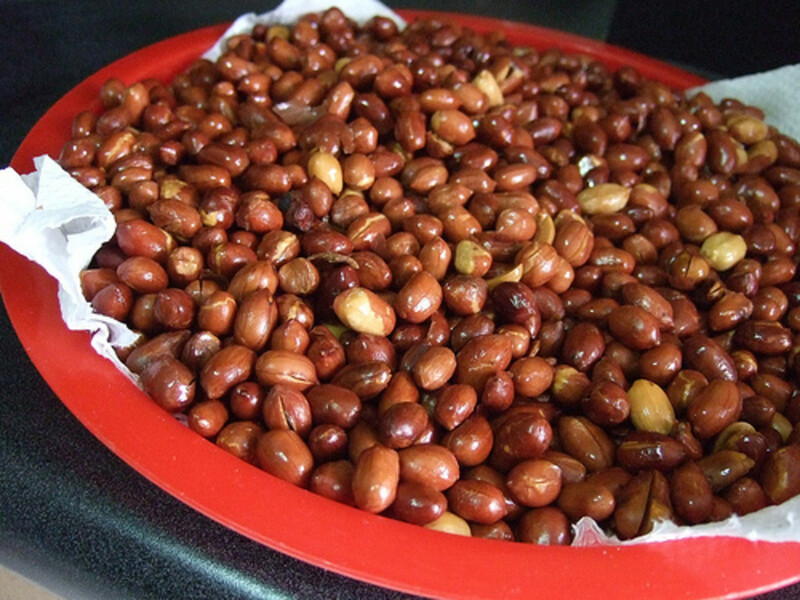 Another hard to resist street eat are the boiled or deep-fried peanuts sold on stands in the side walks, on bus stations and even on piers. 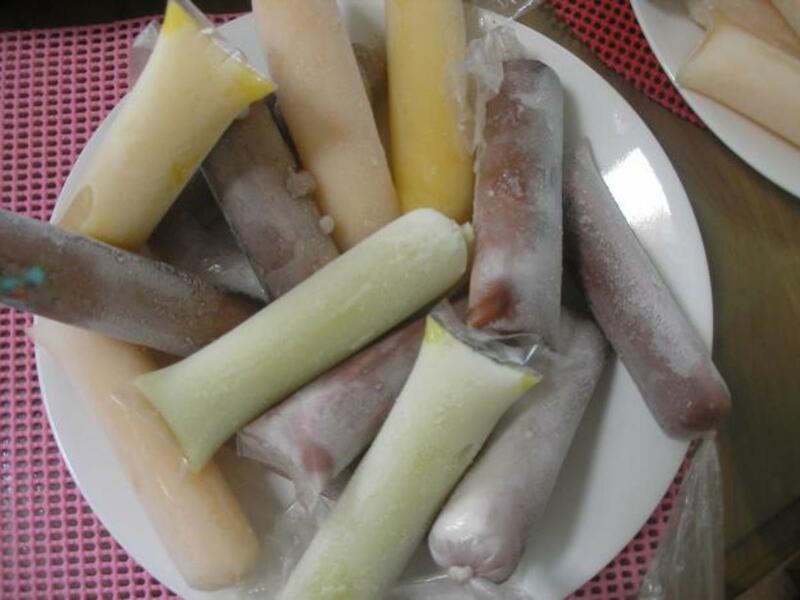 With the country's hot Summer days, ice candy is a popular refreshment. This Filipino ice popsicle is made of either fruit or chocolate. And the commonly used flavors are mangoes, avocado, melon and coconut where the last two is often filled with the shredded fruit. Ice candy is specially enticing to students as they take their recess or the walk to and from school. 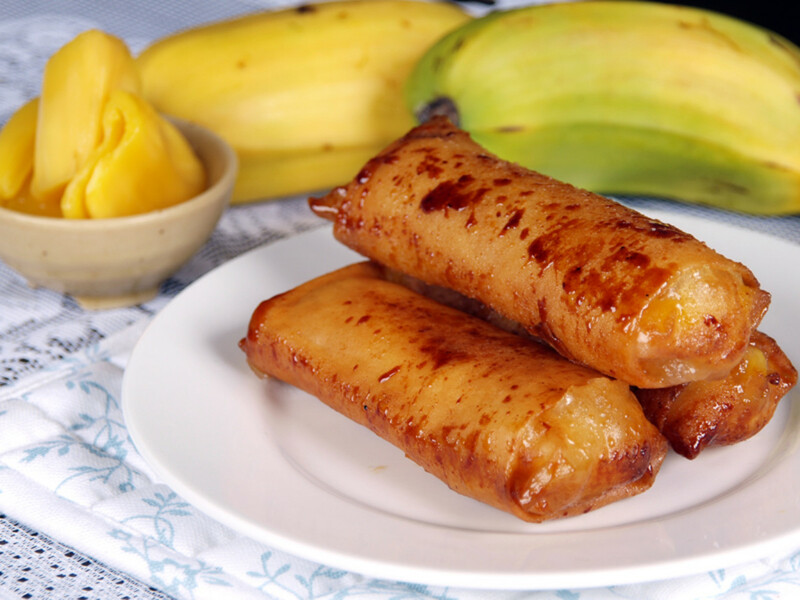 Sweet and crunchy, turon is deep-fried ripe saba banana wrapped in spring rolls. These are naturally sweet and that can lessen the amount of sugar used if wanted. Rolled in brown sugar, cut in halves saba bananas are wrapped and fried. Turon can often be seen sold along with banana cue and camote cue. 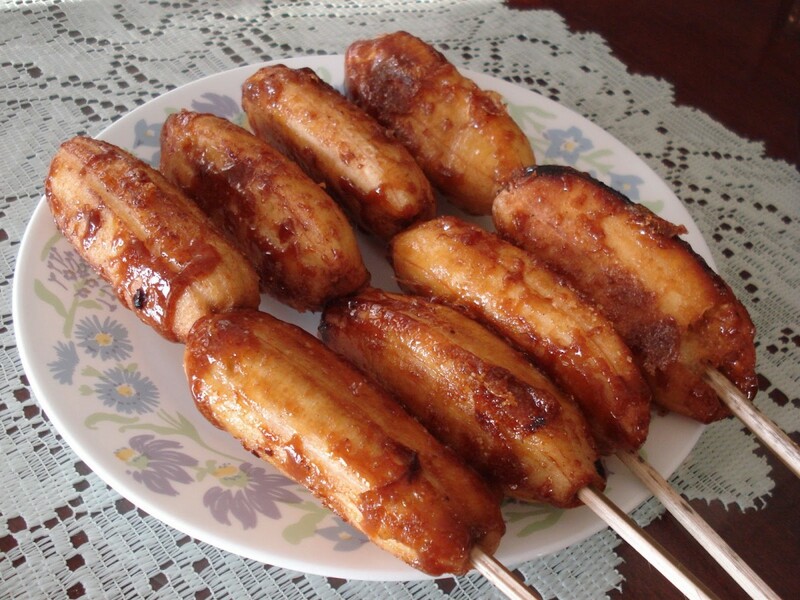 Banana cue is a favorite merienda or mid afternoon snack. Made from fried Asian plantains called saba, banana cue is deep-fried coated with brown sugar while frying and skewered in bamboo skewer sticks. The same process goes with camote cue. 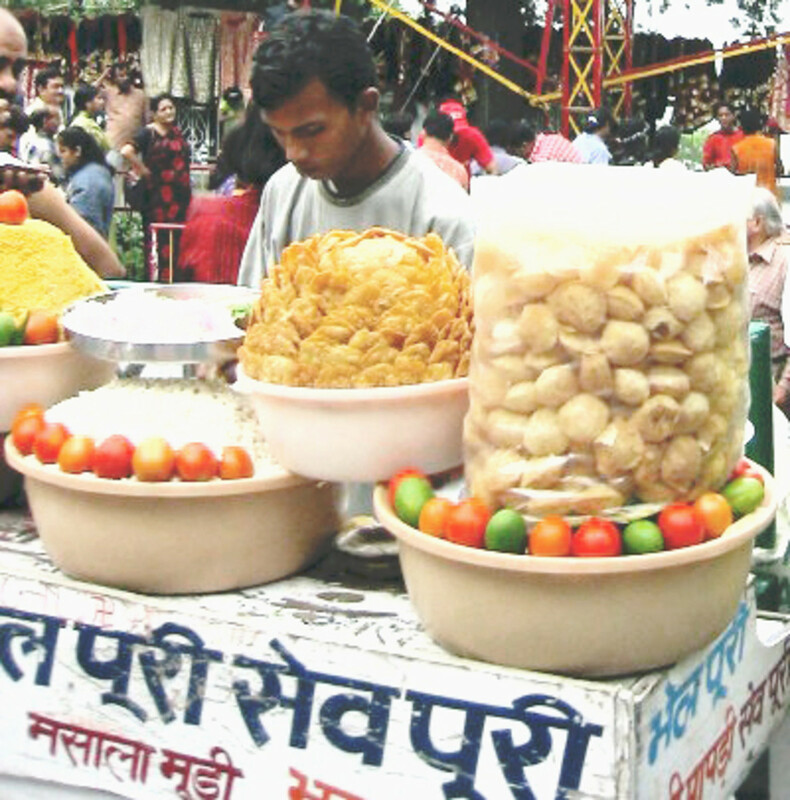 Both is not only seen on street vendors but is also sold on school canteens. Up for a short quiz? 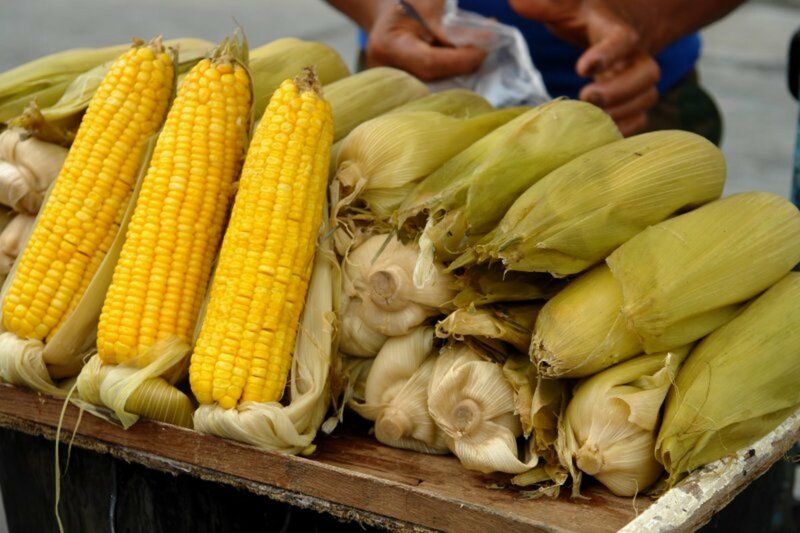 Boiled and grilled sweet corn is another usual street eat. 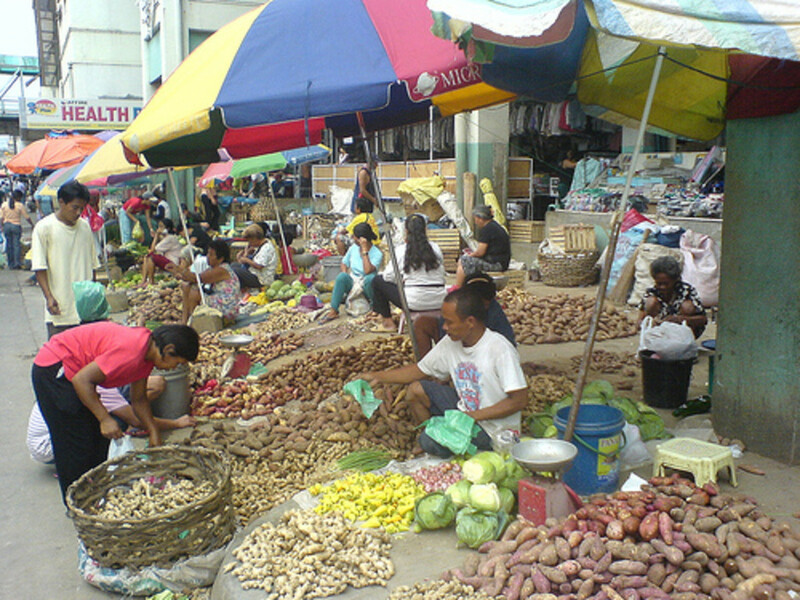 Often seen sold along with other street foods such as boiled and fried peanuts as well as boiled eggs and balut. A good choice for healthy snacking specially on cold rainy days while waiting for that next bus ride. 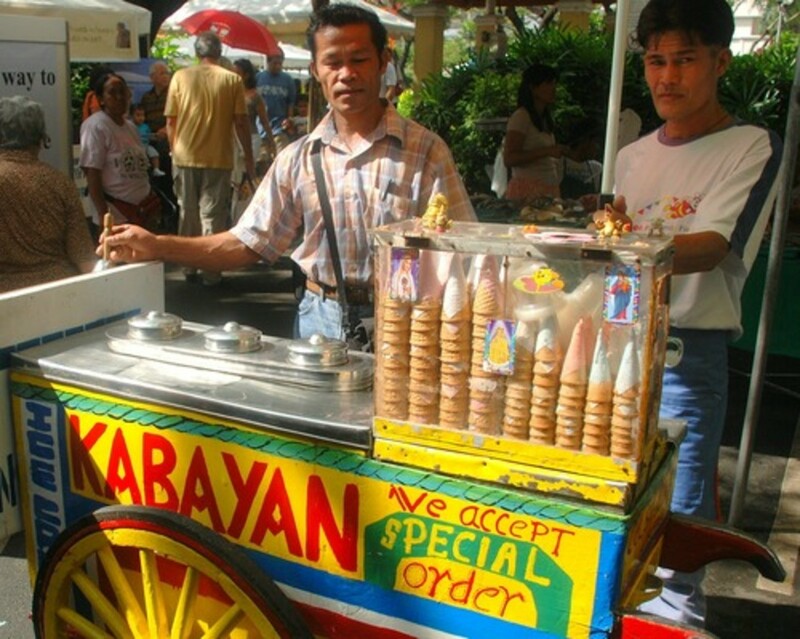 Philippine ice cream peddled on carts and sold on cones or buns. It is made of coconut milk, carabao's milk and cassava flour. It also comes in many different flavors. Coconut, mango, avocado, strawberry and chocolate are just few of the favorites. Sorbetero's are the vendors that sell the sorbetes or ice cream in a lively colorful carts. Too hot and thinking of having an ice cream? A handheld bell will let you know an ice cream seller or sorbetero is around. Read and get to know other favorite Filipino dishes. 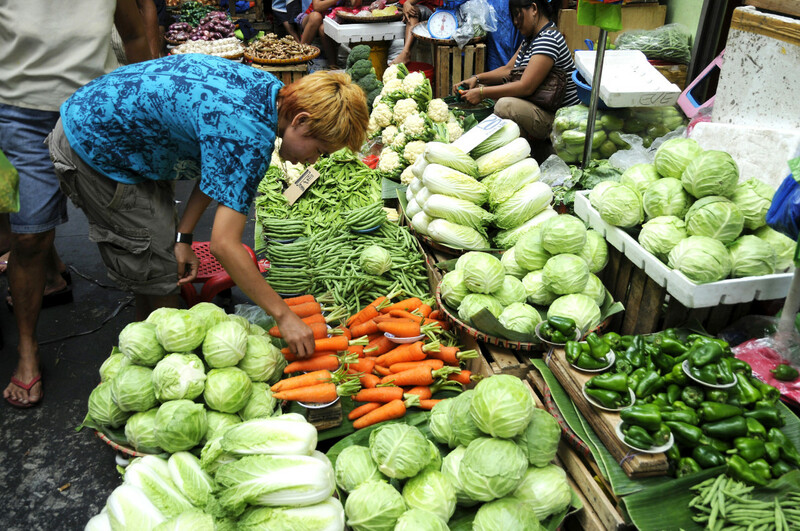 From the famous adobo, to nilaga (beef stew,) and Ilocano dishes such as pinakbet and papaitan, there's more to know about. We all are looking forward for the warm weather. But for a super hot Summer, this desserts are the favorites in the Philippines and Filipinos abroad still sought after. These are easy to make thou so others prefers making it at home. You can really get a feel for the culture of a place from sampling street foods. They're always popular, and usually unique to the area. Nice hub! Nice hub on interesting topic. Awesome street foods, precy. You reminded me of the street foods we have here. I think vendors plying these street foods and shouting aloud is a common factor. Glad to know you had tasted some and liked it Drbj :) I like both, but if there's something I haven't tried yet that wanted to, that would be the kikiam. Thanks for stopping by! Thanks Avian! ^-^' I like calamari, or I should say calamares instead :) The first time I had it was on a birthday party. Great material, precy anza. Calamari is very popular around heere. I never got to have it until this past year. I have not been able to try anything else, as I didn't know about it.